David Miranda, the Terrorism Act, and the abuse of law to hide state surveillance. When governments use terrorism laws to silence journalists, anti-terrorism has run its course. 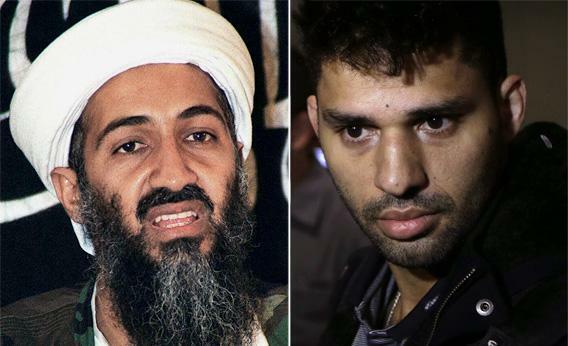 Left: Undated file picture of Osama Bin Laden in Afghanistan, August 1998. Right: U.S. journalist Glenn Greenwald’s partner David Miranda, Rio de Janeiro, Aug. 19, 2013. Now the United Kingdom has pushed the definition one step further. It detained David Miranda, the domestic partner of Guardian journalist Glenn Greenwald, for nine hours at Heathrow Airport—threatening him, interrogating him, and confiscating his laptop and other storage devices—under an anti-terrorism law. According to the U.K., this statute authorizes detention and confiscation because Miranda’s documents expose sweeping government surveillance methods and therefore, if released, might help terrorists evade that surveillance. Counterterrorism now justifies the use of force to prevent the exposure of domestic spying. Call Miranda, Greenwald, Poitras, and Snowden whatever you like. Call them reckless leakers, anarchist zealots, enemies of the state. One thing you certainly can’t call them, under British or American legal definitions, is terrorists. They’re trying to expose, through the exposure of state secrets, what they regard as violations of civil liberties. They aren’t trying to intimidate the public or advance a religious or racial cause. Their politics and ideology are purely libertarian. If that’s terrorism, then anyone who opposes the extension of state power is a terrorist. Notice May’s substitution of a single, significant letter. Under her interpretation of the Terrorism Act, police can detain you and confiscate your belongings if they think your information could (not just would) “help terrorists.” The fact that your information, from a civil libertarian standpoint, would help everyone is beside the point. You’re forbidden to disclose it—and police are authorized to detain you and confiscate it—because some of the people it could help are terrorists. They might learn how to circumvent surveillance, thereby leading eventually to a loss of life. In other words, only intelligence agencies can decide which secrets justify the use of the Terrorism Act’s detention and confiscation provisions. Most political movements that begin with good grounds and good intentions eventually overextend and discredit themselves. It happened to socialism. It happened to anti-communism. At various times, it has happened to liberalism, conservatism, and libertarianism. Now it’s happening to anti-terrorism. The last people to recognize the abuse and destruction are the abusers themselves. Just ask David Miranda.